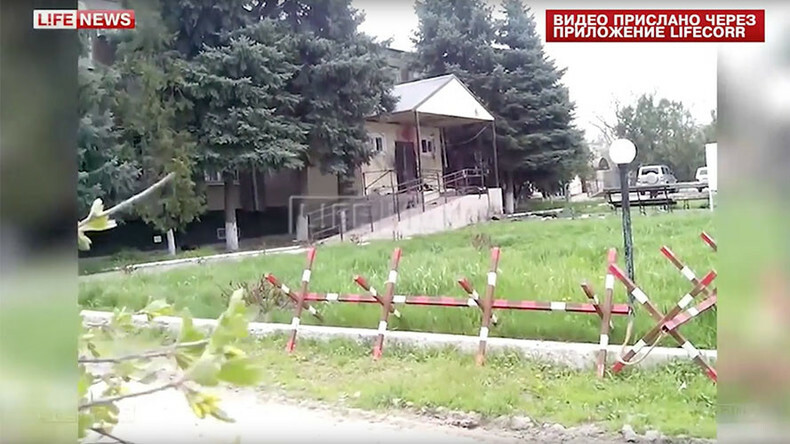 Three militants were killed in a botched attack on a police station in southern Russia. Two of them were killed by officers defending the station while another one used his own grenade to kill himself. They were the only ones hurt in the attack. The incident happened in the town of Novoselitskoye in the Stavropol region, close to the turbulent Russian North Caucasus. Three armed people tried to enter the local police station on Monday morning, but were spotted by the officers. There were conflicting initial reports about the circumstances of the ensuing firefight. Local police said there were two gunmen, one of whom was killed by gunfire at the checkpoint. Some media reported that four people were involved in the attack, which was called an attempted suicide bombing. Later the Stavropol department of the Interior Ministry said there were three attackers and that all of them were dead. The building and cars parked near it were damaged by gunfire and explosions during the clash, but no casualties were reported among police officers or civilians. “The professional and well-judged actions of the police helped prevent any harm to civilians and officers,” a spokesperson for the Interior Ministry said. A bomb expert team was deployed to the scene. The Interior Ministry and the Federal Security Service also sent investigators. Security has been ramped up in the town and the surrounding area, which has some 26,000 residents. The identities of the attackers and their possible links to the insurgency in southern Russia are being investigated. A RIA Novosti source said that one of them is a local resident who was released from prison last winter after serving a term for murder.